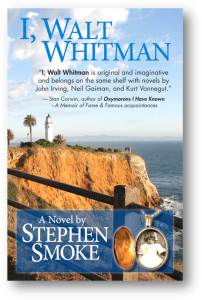 LOS ANGELES, CA – Stephen Smoke will release his new novel I, Walt Whitman, in three formats on Tuesday, October 2, 2012: softcover, eBook, and multimedia eBook for the iPad. In addition, the accompanying soundtrack album, portions of which are embedded in the iPad version, will be available on popular music download sites, including iTunes and Amazon, the same day. I, Walt Whitman deals with reincarnation, death and dying, and how we cope when someone close to us passes on. Despite the weighty topics, the book is light-hearted and humorous. The premise is that an out-of-work writer who considers it possible that he is Walt Whitman reincarnated, hooks up with a desperate lawyer who decides to sue Whitman’s publishers for 150 years of back royalties. This is Stephen’s third novel that contains a soundtrack. Cathedral of the Senses was the first. It was released in May of 2011. The second was Trick of the Light, which was released in July of 2012. However, Trick of the Light was originally published in 1989 to great success (it was optioned for film by Hemdale Film Corporation, which won Best Picture Oscars for “The Last Emperor of China” and “Platoon”). Trick of the Light included a soundtrack (in cassette form at that time) made up of songs written by Stephen and recorded by him and several famous musicians, including Rock and Roll Hall of Famer, Garth Hudson of The Band, Peter Meisner and Barry Keenan. Stephen Smoke is the author of 30 books and 20 novels, published mainly by major New York publishers including HarperCollins and Warner Books. Stephen is the first author to have three novels, each with its own soundtrack, consisting of songs written by the author and embedded in a multimedia, iPad version. To listen to the I, Walt Whitman songs, or songs from the Cathedral of the Senses or Trick of the Light soundtracks, click the appropriate links on the side of this page. You can also sample the songs at all major music download sites, including iTunes and Amazon.